Mijas has a rich history. The Romans used the village, then known as Tamisa, as a trading centre because of its handy location between Malaga and Cadiz. Later the Moors settled in the village and changed the name of the village to Mixa which then became the modern day Mijas. The church in the village was built on the remains of a Moorish castle that stood from the 8th to the 15th Century. The village was a target for pirates in the early 19th century and watchtowers were built to lookout for attacks. These watchtowers can still be seen today. Like many of the villages on the Costa del Sol Mijas relied on agriculture and fishing as its main source of income. 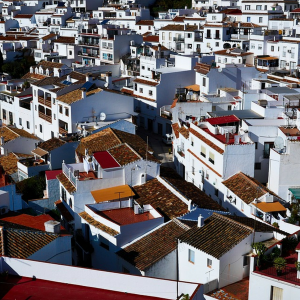 Farming communities all along the Mijas Costa like La Cala and Las Lagunas began to grow into urbanizations attracting tourists and new housing in the 1950s when Mijas also opened its first small hotel. Since then Mijas has grown into a tourist hotspot but the village has still retained its magical Andalucian charm. Mijas has a wealth of amenities including shops, banks, restaurants and accommodation. The narrow cobbled streets give the impression that you have travelled back in time but the village actually has everything you need tucked away down its little passageways! La Alcazaba Restaurant is perched on the side of a cliff and it is famous for its stunning views down to the coast. You will pay a little more for food here but it is good quality and it is worth it for the views; a great place for a romantic dinner for two. 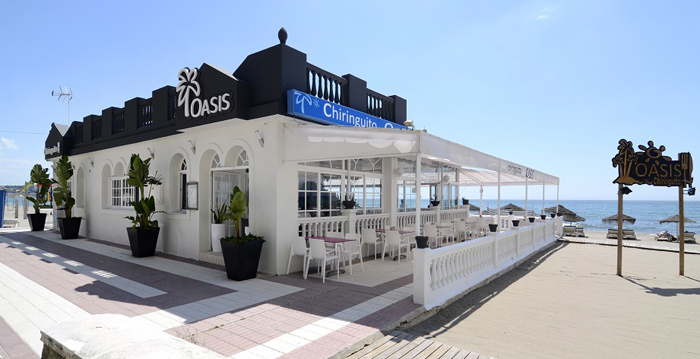 It is not just traditional Spanish food served up in the village; there are Indian restaurants and a fantastic Thai restaurant at, ‘Molino del Cura’. 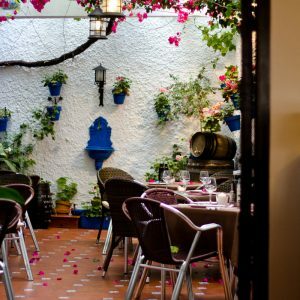 You certainly won’t be short of good places to eat and drink in Mijas. For those of you that enjoy being more active Mijas has lots of outdoor pursuits to offer. Hiking and walking in the surrounding Sierra de Mijas mountain ranges is very popular and walking maps can be picked up from the tourist office in the village. The area is also popular with mountain bikers and rock climbers. In the botanical gardens in the village there is a rock gorge which has been customised so that climbers can practice. The use of this is free but make sure you know what you are doing! 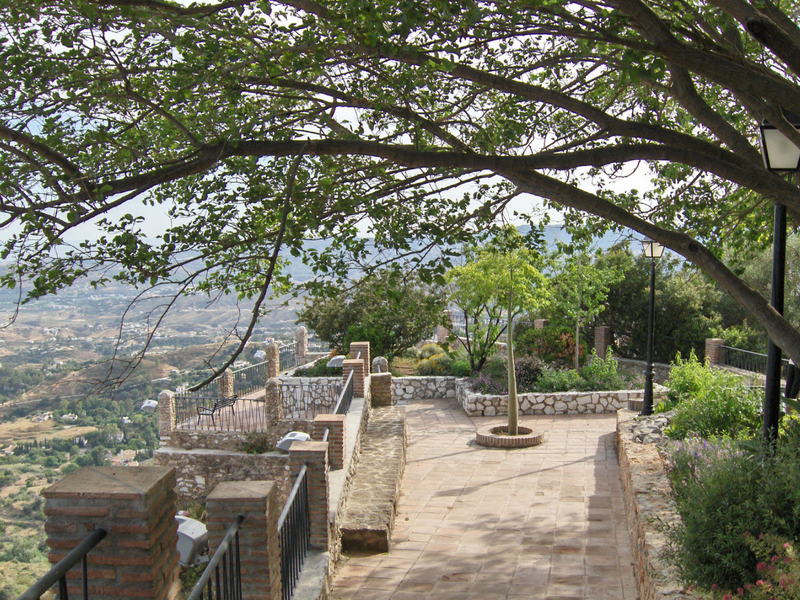 The surrounding area of Mijas is brimming with golf courses, shops, bars and restaurants. 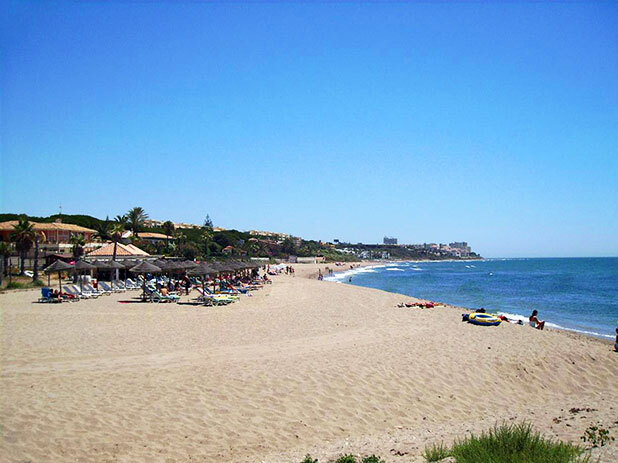 Calahonda and Riviera del Sol are especially well equipped with large commercial centres. Its no wonder that Mijas is such a favourite with tourists, it is the quintessential sunshine holiday destination. The larger towns of Fuengirola, Benalmadena and Marbella are also within easy reach for lively nightlife and endless shopping opportunities. Where do we start? 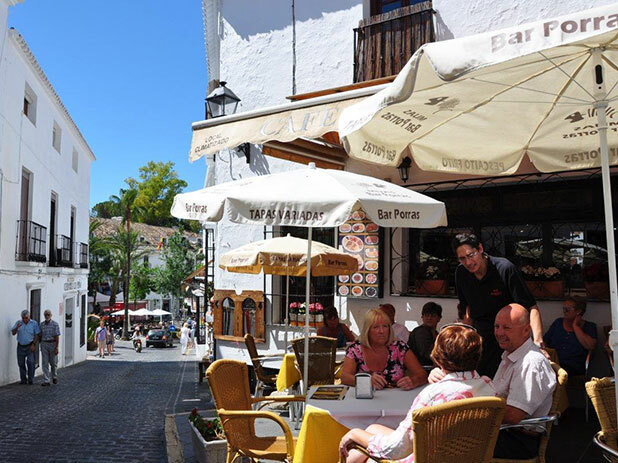 There is so much to do and see in Mijas it will keep you busy for days! Mijas Pueblo is so full of history it would be wrong to visit the village and not take some of this in. Every village has it’s legends and Mijas is no different; the ‘Grotto of the Virgen de la Pena’ is located near to the main car park and the town hall in the village and legend has it that in 1536 two children saw an apparition of the Virgin with a child in her arms and a white dove on her shoulder here and subsequently an image of the Virgin was found here that had been hidden for 500 years. This grotto is now viewed as a religious sanctuary and people leave flowers and gifts here from all over the world. Mijas pueblo has its own bullring that still hosts bull fights today (not recommended for the faint hearted.) The Plaza del Toros dates back to 1900 and it is one of the very few bullrings in Spain that is an oval shape. Bullfighting takes place over the summer months on a Sunday but you can visit the bullring and the small museum at the entrance of the ring all year round. If bullfighting isn’t your thing the flamenco show at the start of every bullfight may be more entertaining. Right near to the bullring you will find the Church of the Immaculate Conception which was built in 1631 and it sits in very pretty gardens that offer a great view down to the coast. It has become a popular wedding venue for people wanting a traditional church wedding in Spain. For those wanting something a bit out of the ordinary why not visit the Mijas Museum of Miniatures. The museum has over 300 pieces of miniature models Leonardo Da Vinci’s famous ‘Last Supper’ made out of grains of rice! 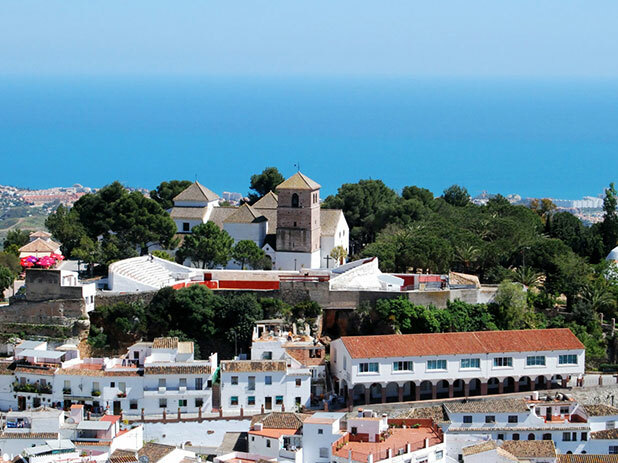 If you time your visit right you will get to enjoy one of the festivals and ferias in Mijas. Easter week is always a big event in predominantly Catholic Spain and the celebrations in Mijas are no exception. There are processions through the village in the week proceeding Easter Sunday on Maundy Thursday, Good Friday and Saturday. Hundreds of people parade through the streets in elaborate costumes and statues of Christ and the Virgin Mary are carried. It really is an impressive sight. Make sure you get to the village in plenty of time as it can get very busy on these occasions. Mijas International Day is usually the first or second Saturday of May and villagers get into the party atmosphere with drinking, dancing and costume wearing. Many different countries are represented and celebrated with food and drink from all over the world and live music. The annual Mijas Fair is usually on or around the 8 September in celebration of the Patron Saint of Mijas, The Virgin of the Rock. The main square is the hub of all the activity with stalls and bars set up selling lots of lovely food and drink. Locals get dressed in all their flamenco finery and even the horses get all dressed up for this big event. It’s all about partying on this special day so it’s a great time to visit the village. Mijas also has lots of activities on offer for the family. 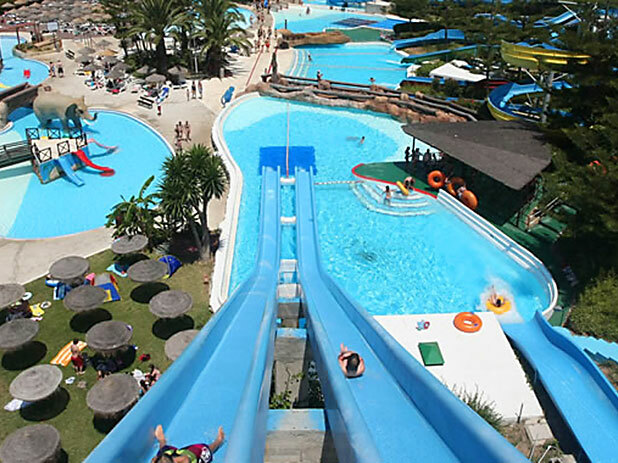 Mijas Waterpark is a great day out for all the family with a large wave pool, waterslides and smaller attractions for young children. Mijas places those with children in a great location for reaching out and trying some fantastic fun activities in the sun. Visit the Sealife centre, Fuengirola Zoo or the Crocodile park or try some fast pavced go karting or boat trips. If it is soft play slides and adventure you want then Selwo Aventura or Tivoli World have to be your destination, there are plenty of days out for children in and around Mijas. There are several golf courses on the Costa to choose form including Mijas Golf, Miraflores Golf, Satana Golf and El Chapparel. Keen tennis players can visit the Lew Hoad Tennis Club which was set up by the famous Australian player from the 50s and 60s who settled in Mijas and decided to open up a tennis club on his country estate on the road up to Mijas. The club has great facilities including a swimming pool, gym and steam rooms. The impressive Miramar Shopping Mall is located just off the main coastal road near to Mijas Golf and isand this has a cinema (that shows films in English), a whole Mall of shops and places to eat. 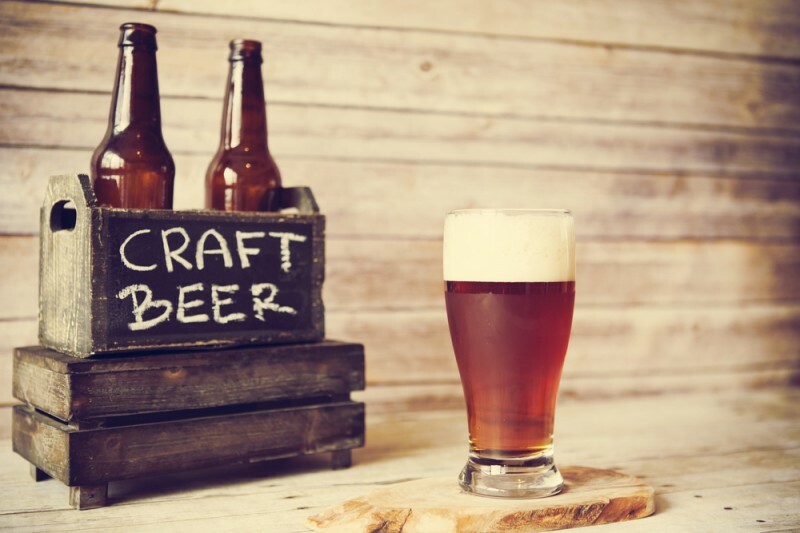 If you are looking for that something to take home for family or friends or a simple reminder of your wonderful holiday in Mijas then these great gift shopping ideas will be very useful. Whatever you are looking for Mijas is sure to offer it. If you are looking for that extra piece of inside information why not take a look at a locals guide on how to spend 24 hours in Mijas. View our range of fabulous Mijas Villas and Apartments and experience all this for yourself.